Madeleine found it in the April 2010 issue (page 80). And, after reading the ingredient list, you will probably find it on your dinner table tonight. 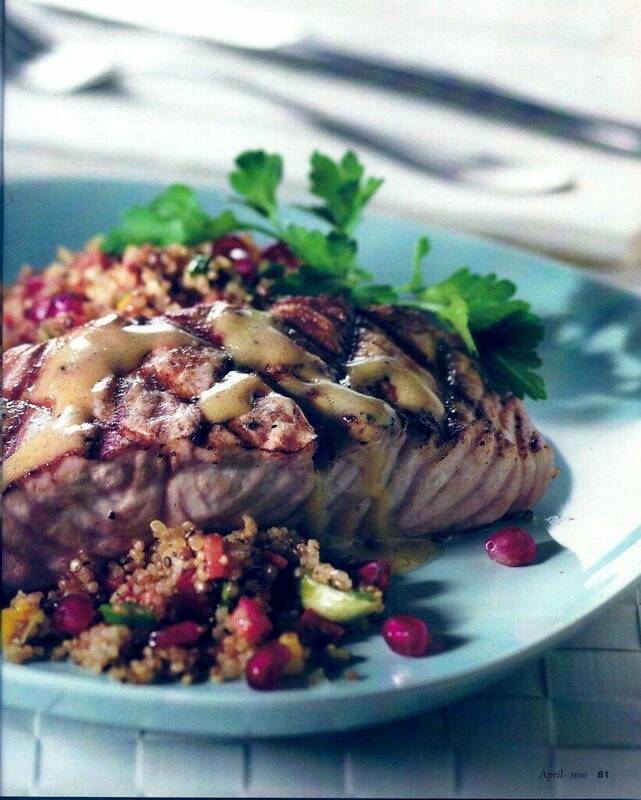 What a pair: salmon and quinoa two of the very best superfood. This simple and colourful supper dish packs a great nutritional punch. If you’ve never cooked quinoa before, it is much like rice. Be sure to rinse the grains thoroughly before cooking. Whisk the honey, soy sauce, mustard and sherry in a bowl and set aside. Preheat the grill. Baste the grill with a little vegetable oil. Place the salmon, flesh side down and cook just a few minutes (3 to 4 minutes). Turn the filet, baste a little of the sauce over the salmon and continue without turning until the salmon is cooked through. Just before removing from the heat, baste the salmon with remaining sauce. Quinoa should be placed in a colander and rinsed with cold running water for a few minutes to remove saponin, a natural bitter tasting coating on each grain. Drain well before proceeding. Place 1 tsp oil in saucepan. Toast the quinoa for 2 minutes over medium-high heat. In a separate pan, heat 1 Tbsp vegetable oil over medium-high heat. Add onion and carrot and saute until translucent. Add the toasted quinoa and chicken stock. Bring to a boil reduce heat and simmer, covered for 10 minutes. Remove lid and continue to cook until all the liquid has been absorbed. Remove from the heat and place lid on top, let steam for 5 minutes longer. Remove the lid and fluff the mixture with a fork. Toss in the green onions and peppers. Cool the mixture to room temperature. Whisk the rice wine vinegar, honey, vegetable oil and sesame oil together in a bowl. Pour over the quinoa and toss lightly. 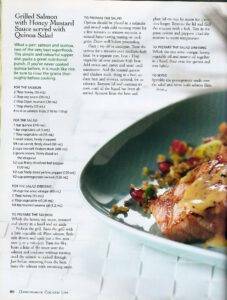 Sprinkle the pomegranate seeds over the salad and serve with salmon filets.